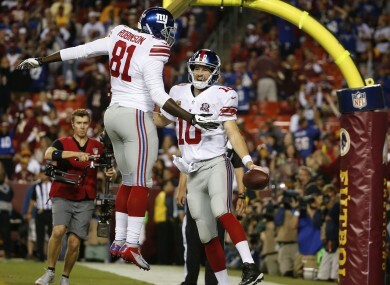 Giants tight end Larry Donnell finished with three touchdown catches. Quick, go pick him up for your fantasy team now. THE NEW YORK GIANTS caught 32 passes. Twenty-eight were thrown by Eli Manning, and four came from the arm of Kirk Cousins. Manning’s four touchdown passes equaled Cousins’ four interceptions in the Giants’ 45-14 win over the Washington Redskins last night. After struggling in his first two games, Manning has mastered enough of the West Coast dink-and-dunk to lead the Giants (2-2) to consecutive victories. He is supposed to complete 70 percent of his passes in this offense, and he surpassed that mark against the Redskins, going 28 for 39 — including three simple open-field drops — for 300 yards with one interception. The top beneficiary has been Larry Donnell, who had similar, twisting touchdown catches of 5, 6 and 6 yards. The 6-foot-6 tight end finished with seven catches for 54 yards. He had only one career touchdown catch entering the game, but he now leads the Giants this season in TD catches (four) and overall receptions (25). Not bad for a second-year player who wasn’t drafted out of Grambling State. Cousins, who has the starting job while Griffin recovers from a dislocated ankle, was responsible for five of Washington’s six turnovers. He went 19 for 33 for 257 yards with four interceptions and a fumble. Email “Manning throws 4 TDs, Cousins throws 4 INTs as Giants trounce Washington”. Feedback on “Manning throws 4 TDs, Cousins throws 4 INTs as Giants trounce Washington”.